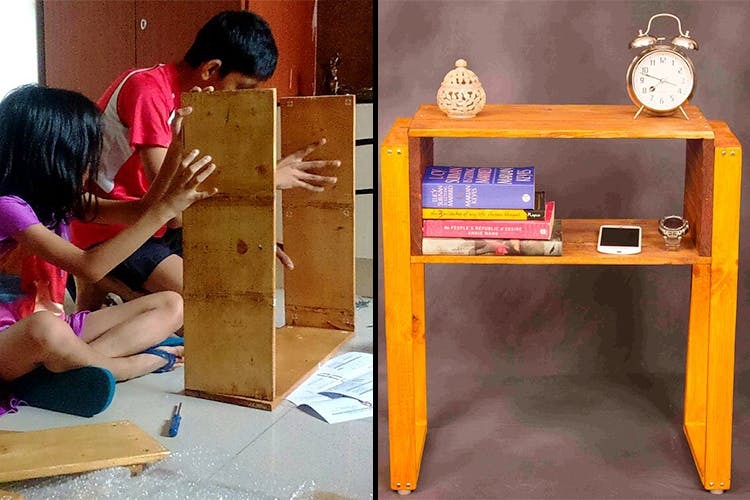 Ubyld is a unique DIY furniture store based out of Bangalore. Their DIY kits are essentially beautiful planks of upcycled pinewood that come with an instruction manual and necessary nuts and bolts for easy assembly. You’ll find lots of cool bookshelves, shoe racks, tables, chairs, planters and cabinets here. If you’re the creative variety, you’ll know that nothing rivals the time spent with bae building your nest from scratch or huddling around family decoding the manual and making stunning coffee tables. So finding a site that could make it happen was literally the next best discovery for us after an aircon, of course. The fact that no trees are cut in the process makes the summer project idea even more noble. You get to choose the colour of the wood varnish and the shipping includes no extra cost. We probably run the risk of sounding like the overenthusiastic teleshopping hosts, buy hey, this venture is so cool, FTW. Right from there 20-minute airplane shelf to the spunky, laidback chairs for TV time, we’re digging so many things for our home here and good news is, it’s all easy on the pocket too. If you’re in Bangalore, feel free to order all the pre-assembled goodies but for us Delhi peeps, we can only lay our hands on the DIY collection. Ask us if we are sad about the latter part and we’d say, hell no. Where’s the fun in getting everything on the platter. Right?